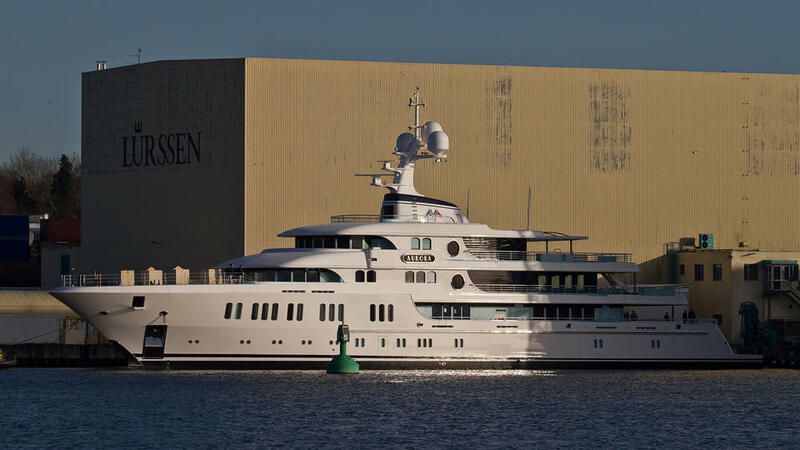 The 74 metre Project Thor has been launched by German superyacht specialist Lürssen and named Aurora. Styled inside and out by British studio Winch Design, Aurora is the smallest yacht to be launched by Lürssen since 2014 when the yard splashed the 65.99 metre Elysian (ex-Ester III). 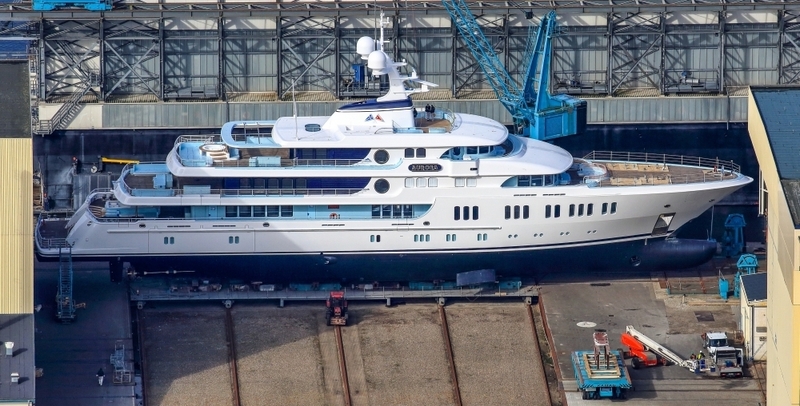 Nonetheless, she will still join the ranks of the world’s top 200 largest superyachts when she is delivered before the end of the year. Aurora hit the water in Germany earlier this month. Aurora was sold by Moran Yacht & Ship in 2014, and Sean Moran who project managed the build, explained: "The client wanted a large volume ocean-going yacht that could accommodate all of his family without them feeling on top of each other. "Issues inevitably come up during the course of a project, but from a long track record of successful projects we have strong working knowledge of how shipyards operate. This is one of our major competitive advantages in the field of new construction, and the reason why we have such a long list of repeat clients that have built multiple projects with us." Aurora has been built to Lloyd’s Registry standards with a beam of 13.2 metres and a larger interior volume than any other yacht in this size bracket. Extensive exterior spaces are visible in this first post-launch photo, with an observation deck above the wheelhouse, a large foredeck and three sprawling aft decks, ideal for al fresco relaxation. The exterior design is a marked departure from the original renderings, with an emphasis on curved lines and classic elements such as circular portholes. Moran added: "There were many developments during the design phase of the build and we ended up very far from where we started. In the end, the owner wanted to go for a more classic look with some Art Deco elements and we are really excited with how she came out. Winch Design has such a talented and dedicated team and the results speak for themselves." 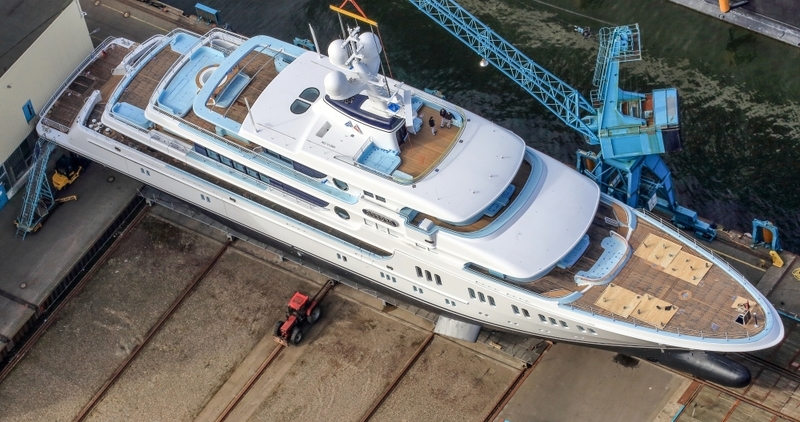 Other superyacht projects currently under development at the German yard include the 123 metre Project Jupiter, the 104 metre Project Mistral, the 85 metre Project Sasha and the 135 metre Project Thunder, all of which are due for completion before the end of the year.